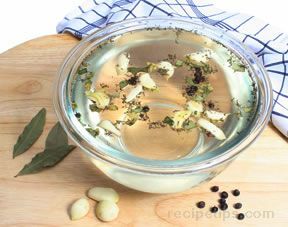 Combine the apple cider, brown sugar, salt, peppercorns, juniper berries, bay leaves, cinnamon, and cloves in a large pot or bowl. 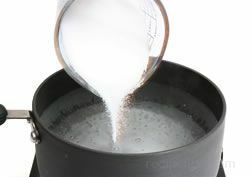 Stir to dissolve the sugar and salt. Combine the mixture with the beer in a 40-quart cooler, or large plastic container. 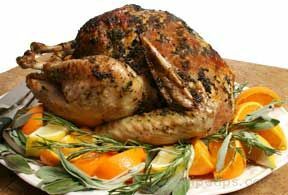 Place the turkey in the brine and, if necessary, weigh down with heavy dinner plates to completely submerge. Cover with plastic and refrigerate for 24 hours. 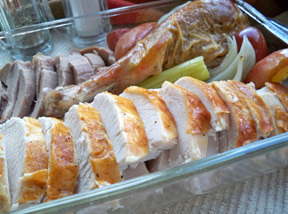 Spread the onions, celery, carrots, and garlic in the bottom of a large roasting pan. Add the turkey neck to the bottom of the pan. 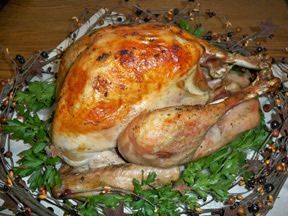 Preheat oven to 400° F.
Remove the turkey from the brine and rinse well under cold running water. Pat dry with paper towels and place on top of the vegetables in the roasting pan. Combine 1 stick of the butter and the Essence in a small pan and melt over medium heat. Remove from the heat. 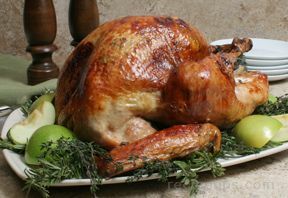 With a pastry brush, baste the top and sides of the turkey with half of the butter. 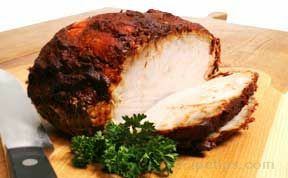 Roast for 30 minutes. 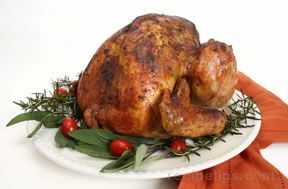 Baste the turkey with the remaining seasoned butter, reduce the oven temperature to 300° F. and roast for 30 minutes. 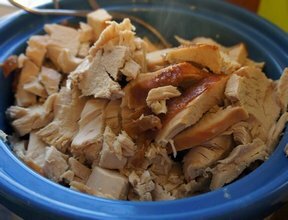 Baste the turkey with 1/2 C. of chicken stock. 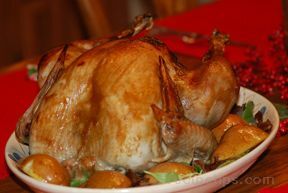 Return to the oven and roast until golden and an instant-read thermometer inserted into the thickest part of the thigh registers 160° F, 1-1/2 to 2 hours longer, basting once with 1/2 c. of the chicken stock. 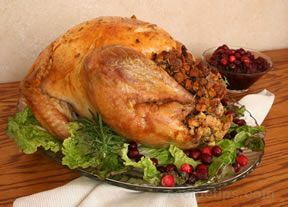 Remove the turkey from the oven and transfer to a platter or cutting board. 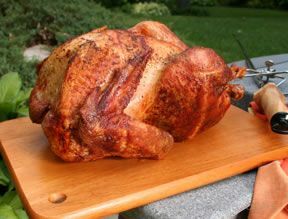 Tent with foil and let rest for 15 minutes before carving. Melt the remaining T. butter with the olive oil in a medium heavy pot over medium-high heat. 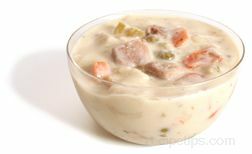 Add the reserved giblets and cooked turkey neck, and cook, stirring, until browned, 2 to 3 minutes. Add half of the vegetables from the roasting pan and cook, stirring for 5 minutes. Add the flour and cook, stirring, for 1 minute. Add the white wine and stir to deglaze the pan. 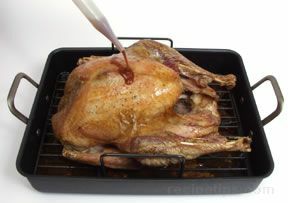 Add the remaining 3 C. chicken stock and any juices accumulated in the roasting pan and bring to a boil. 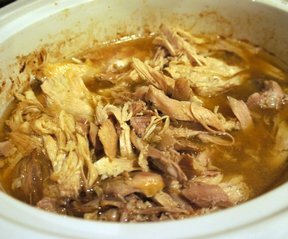 Reduce the heat, add the sage, and simmer briskly until reduced by half, about 10 minutes. 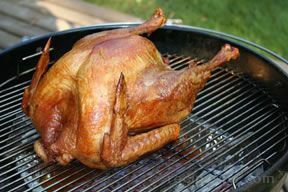 Remove from the heat and discard the neck. 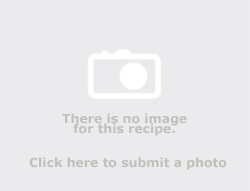 In batches, pulse the liquid and solids in a food processor into a thick liquid. 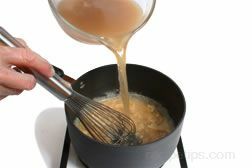 Strain through a fine mesh strainer into a bowl, pressing against the solids with a spoon to extract as much liquid as possible and transfer to a gravy boat. Adjust the seasoning to taste. 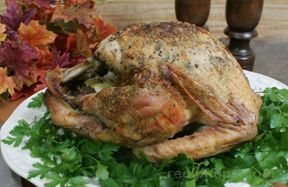 To serve, carve the turkey and serve with the gravy.